As I blogged recently, I’m back making bread. Bread making is fascinating–on the one hand, humans have been making bread for about 15,000 years when all they had was some coals and some ground up grains (Egyptians and Indigenous Australians were both making loaves that long ago)–and since then, for millennia, people made perfectly edible loaves with rudimentary tools all over the world. Bread making, anyone can do it. On the other hand, bread making is extraordinarily technical. Modern bread production is highly technologised, with specialised ingredients, equipment and training. Even making a modern loaf at home for serious bakers involves a whole raft of equipment and techniques not used for any other kind of cooking. The third thing, though, is regardless of whether you make ‘anyone can do it’ bread or a really impressive loaf, only a few people actually bother to make bread at all. Yes, this is another metaphor about writing. Let’s see if it goes somewhere useful. Nearly everyone can write. In most developed nations over 90% of the population can write, in many developing nations over 70% can write–and almost everyone who currently struggles to write due to lack of educational opportunities or disability, can learn to write with the right support. And many people do write. The world is awash with emails, reports and social media platforms based on writing (from Facebook and Twitter to WhatsApp or Messenger). But, even though there are far more novels and blogs and articles and reviews out there than at any other time, not everyone is out there writing. Even the highest guesstimates I looked at suggested that online only about 20% of users are creators, and obviously the ratio of published writers to readers will be much more pronounced. Just by turning up and writing, just by turning that writing in, you are doing something unusual and worth celebrating. And the loaf you make is yours and your own. Your climate, your water, your oven, how you knead, the wild yeasts in your sourdough… each of these combines to fill the kitchen with the scent of baking bread, and each mouthful is subtly or radically unlike any other baker’s loaf. Now, I’m not claiming that every loaf you make is going to pass. You will get revisions and rejections, and you will get a loaf out of the oven sometimes and be like ‘Bin. Only place for it’. In the last month I made a loaf in a pot (this is a great technique for improving how much your loaf rises in the oven), and someone said you didn’t need to heat the pot first–so I tried it out and …. got a nasty dense little loaf totally, utterly, irrecoverably burnt to the base of the pot. I did not eat that loaf. This barn was prettier than the loaf I baked in it. However, a couple of weeks ago I was on holiday with some friends in a picturesque barn in upstate New York (at dusk, the field was ablaze with fireflies). We couldn’t find bread I wanted to eat, so I got some flour and yeast from the local store and looked up a recipe online and guessed about converting grams to cups and put in way too much yeast so it was a bubbly yeast monster, so I knocked it back and let it rise and knocked it back and let it rise and did it again till it sort of behaved and then turned it into focaccia and then guessed converting Fahrenheit to Celsius and what the oven would do and slightly charred the top. As it turns out, I had produced a loaf with a crunchy crust, a light interior, and we ate it all. It would more than do to get us through. This is what a loaf should look like. Last night I made a loaf at home with all my equipment. I measured the ingredients. I followed my fine-tuned recipe. I rested the dough in my fancy French linen cloths. I preheated my cast iron pots in my excellent oven. I slashed the dough with my razor-lame at an acute angle for better bloom. I focused. This is a loaf I’m proud of. The thing about writing is is it both a process and a product. You need to focus on both. Some people are so busy planning and tweaking and timing and measuring that they never slap it all together and get it in the oven. Some people are so fixated on producing a perfect loaf that they forget how much is developed and learned by churning out bread regularly, by experimenting and rescuing, and making enough to eat. Some people get as far as “I made a loaf!” (go you! totally cool!) but can’t face sitting down at a computer making loaf after loaf full time for 3 years, plus extra loaves for conferences and publications; and then to keep making loaves for the rest of their lives. A PhD and an academic career requires both quantity and quality. I learned a lot from my less successful bread experiments (you need half as much active instant yeast as instant yeast; it makes a real difference if you do preheat your pot). I kept up my bread making muscles. Most of my mistakes were fixable and could still produce a better loaf than I could buy. But there is still a place for honing your craft, for becoming an expert, for investing in good tools. For making a loaf that is an excellent and original contribution to the world (even if only two or three people eat it, but that’s another post). Next But what if I don’t wanna? 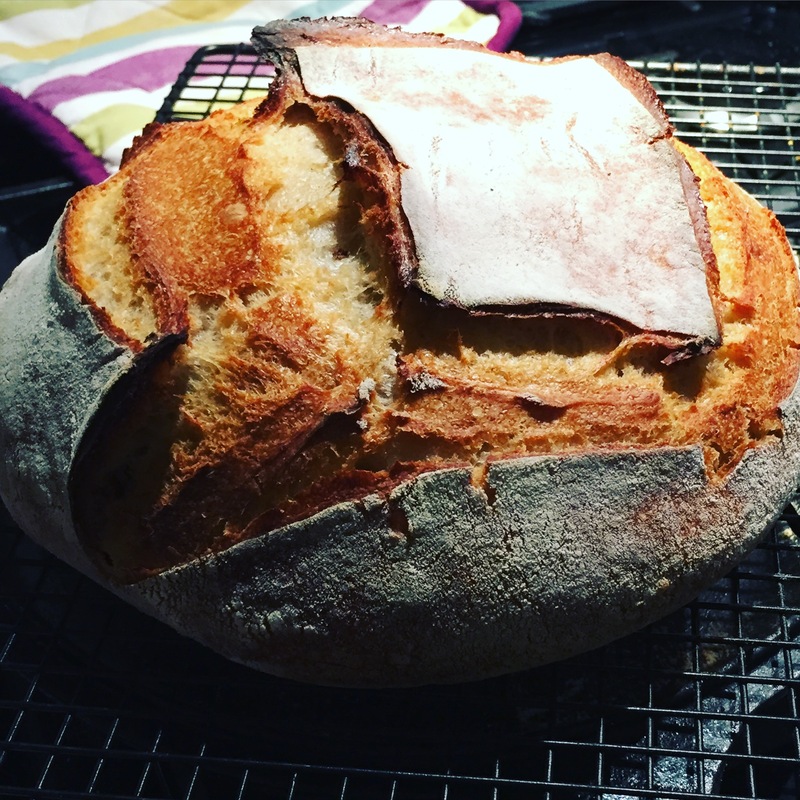 It’s summer, students have largely stopped spamming our inboxes, so it’s time to do some writing… And as I am cleaning up my email inbox in one of those work avoidance moments, I came across this lovely blog about writing and bread-making. It’s really about the PhD, but realistically if you live in a country that has the REF, this never ends! We need the right proportion of ingredients — not too much of this or too little of that. We need an animating principle, like the yeast or leaven — something to enliven us, a passion. We need to be kneaded, mixed well by the slow, rhythmic pattern of everyday life. Periodically, we need to rest in a warm place with a towel over our heads. We need to be punched down, sometimes at the peak of our rising. And we need to be tested in the fires of suffering. Ultimately, our lives are without meaning until we are broken and shared. Father Dominic Garramone, On Bread and You.